Fortress is a massive species with four arms and two faces. He has multiple sharp bladed weapons strapped to his back. Expressions on each of the four faces intensify in the rage of battle. He has the power to project fire from his mighty four swords to destroy his enemies. 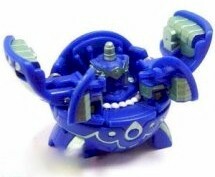 Fortress is Chan's guardian Bakugan. There power levels can reach 680 G's. Fortress has 3 modes: sorrow, anger, and grief. Purchase Fortress from Amazon now!